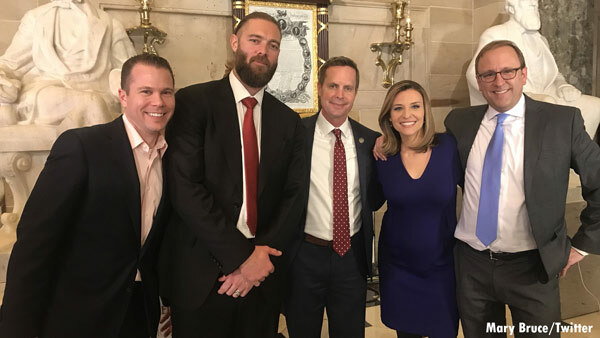 Former Philadelphia Phillies outfielder Jayson Werth was one of the many guests who attended President Donald Trump's first State of the Union address. Werth was a guest of Representative Rodney Davis. Werth, who played the last several years for the Washington Nationals, said he has an organic farm in Davis' district. In an interview after the State of the Union with C-SPAN2, Werth, who was with Davis and lobbyist Matt Mika, said, "I didn't really know what to expect. This was my first time I've ever done anything like this. I've been working with these guys with organic farming and do some stuff with the farm bill. I was really inspired. I felt it was a great time to be an American. I thought President Trump did a great job. He hit all the points. He spoke really well. I was inspired." Werth was a member of the 2008 World Series Championship Phillies team.